The hotel was good for the price. I would stay there again. It was very close to a mall, movie theatre, and just about any shop or resturant you could want. The hotel is well-maintained and the staff was very friendly. My only compaint was that they gave me a very small room next to the elevator (they only have 2 or 3 of these). The staff was very friendly and accommodating. Room was clean and bed comfortable. The security on the front entrance door. Clean Breakfast room. A handicap room #113 was reserved had a bad odor and bed. had to change did not request handicap room. A great place to rest and relax with a great staff to care for you. Quiet and great beds, good location and great people. Ice machine to far from the room. 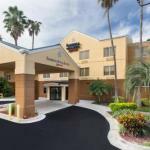 The 107-room Fairfield Inn And Suites by Marriott Tampa Brandon provides quality accommodation at an affordable price equally suited to the pleasure or business traveler. Items included with the room rate a this three-story, non-smoking hotel are an expanded continental breakfast, high-speed Internet access, local telephone calls, a morning newspaper, parking and coffee available in the lobby 24/7. The hotel is located off I-75 at State Road 60 and is 18 miles from the Tampa International Airport. Area landmarks and attractions include five golf courses, the Seminole Hard Rock Casino, Clearwater and St. Petersburg beaches, Florida State Fairgrounds and Busch Gardens. All the rooms and four suites have a work desk with high-speed Internet access, pullout sofa bed, television with cable movie and news channels, pay-per-view movies, alarm clock, tea and coffee making facilities, iron and ironing board, hairdryer, telephone with voicemail and the bathtubs have spray jets. Video games and players are available for rent. This hotel has an outdoor swimming pool and a fitness center. The complimentary breakfast is the only meal served here. Restaurants nearby include a Bonefish Grill, Cherrys Bar and Grill, an Outback Steak House and a Romanos Macaroni Grill. The 24-hour front desk has safe deposit boxes, a list of restaurants that will deliver to the hotel and information on area events and attractions. Other amenities include fax and copying services, a coin-operated laundry, valet dry-cleaning and vending machines. Most guests who stayed at this Tampa hotel were pleased with their stay. The rooms were clean and comfortable and the friendly team of employees did a good job making sure everyone had an enjoyable stay. There were good comments about the extent of the complimentary breakfast and the location close to I-75 and Tampas International Airport. Those who paid in excess of $110 for their rooms thought the prices high. Others thought the prices reasonable for the modern accommodation.